Cuba has a new president, and for the first time in over 40 years, his last name is not Castro. Miguel Díaz-Canel officially became president on Thursday morning after Raúl Castro stepped down and Díaz-Canel was confirmed by the National Assembly. Castro, 86, will remain head of the Communist Party, the most powerful governing body on the island, but his departure from the presidency represents a symbolic shift in an aging leadership. The transition is an effort to guarantee that younger leaders like Díaz-Canel — who has served as Cuba's first vice president since 2013 and turns 58 on Friday — can maintain the power of the Communist-run government put in place by the party's now octogenarian founders. Among Díaz-Canel's immediate challenges are Cuba's economic stagnation and a younger generation's disenchantment with its limited opportunities. Analysts debate how much power Díaz-Canel can wield as president with Raúl Castro still at the helm of the Communist Party. "I think it's going to be very tough for him," said Pedro Freyre, chair of international practice for Akerman LLP. "I don't know that he can do it." Díaz-Canel had long been seen as the overwhelming favorite to replace Castro, after climbing the ranks of the Communist Party. Before becoming first vice president, Díaz-Canel was the minister of higher education. From 1994 to 2003, he headed the Communist Party in the province of Villa Clara where he gained prominence. It was a time when the country was suffering from a severe economic crisis after the fall of the Soviet Union, which had heavily subsidized the island. He became known as an easygoing person who wore Bermuda shorts and got around on a bicycle. The presidential transition comes at a time when Cuba faces an economic recession and an average salary of around $30 a month. Additionally, Cubans are feeling frustrated over the slow pace of market-style reforms initiated by Raúl Castro in 2011 and as relations with the U.S. have cooled significantly under the Trump administration. The diplomatic incident came on the heels of President Donald Trump's reversal of Obama-era policy changes regarding Cuba. And as the U.S. has hardened its policy, Cuba has responded with tough talk. 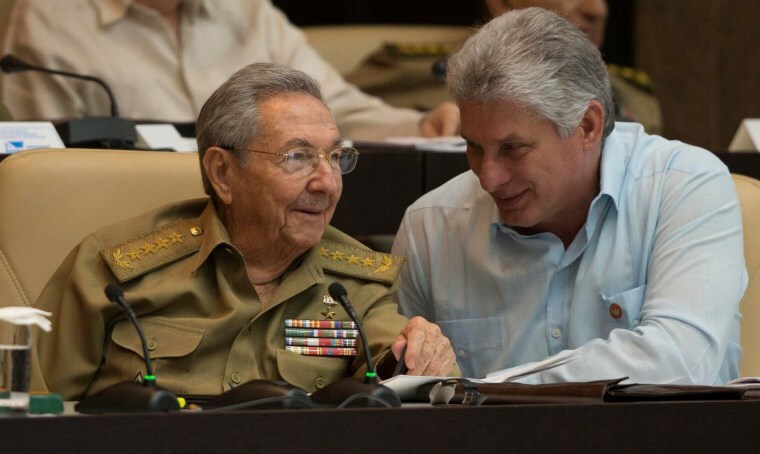 Due to a legal limit established by Raúl Castro, Díaz-Canel can only govern a maximum of 10 years — equal to two terms. Raúl Castro attended the unusual two-day legislative ceremony that started Wednesday where the 605 members of Cuba’s National Assembly voted Díaz-Canel as Cuba's new president. The Cuban National Assembly has generally met and selected the president in one day. Its votes are nearly always anonymous and seen as reflecting the will of the country’s top leadership. According to Cuban state-owned media, the decision to extend this year's vote was made to streamline "a session such importance requires."